The higher the number the harder the wood. These ratings were determined using the Janka Hardness Test which measures the side hardness measure of the force required to embed a .444 inch steel ball to half its diameter into the wood. This is one of the best measures of the ability of wood species to withstand denting and wear. It is also a good indicator of how hard a species is to saw or nail. This should only be used as a general guide when you select wood products including hair wood combs. Depending on where the wood is harvested the results may vary. A wood’s relative hardness is determined with the Janka Rating System, which measures the force required to drive a .444 inch steel ball into the wood until half the diameter of the ball is imbedded in the wood. The Janka Hardness Scale rating has become the industry standard mainly for flooring, however it is a good reference for other wood products. Red Oak, which has a Janka rating of 1290, is the industry benchmark for comparing the relative hardness of different wood species. The majority of our products from Carpenter Tans are Boxwood, Rosewood amd Ebony which are ranging from 2000 to 3500, which belong to hardwood, however with our patented technology and our craftsmanship, every tooth of our combs and brushes is round enough and will make you feel so comfortable during usage. One of our best sellers is the white/black horn combs and scraping plates. 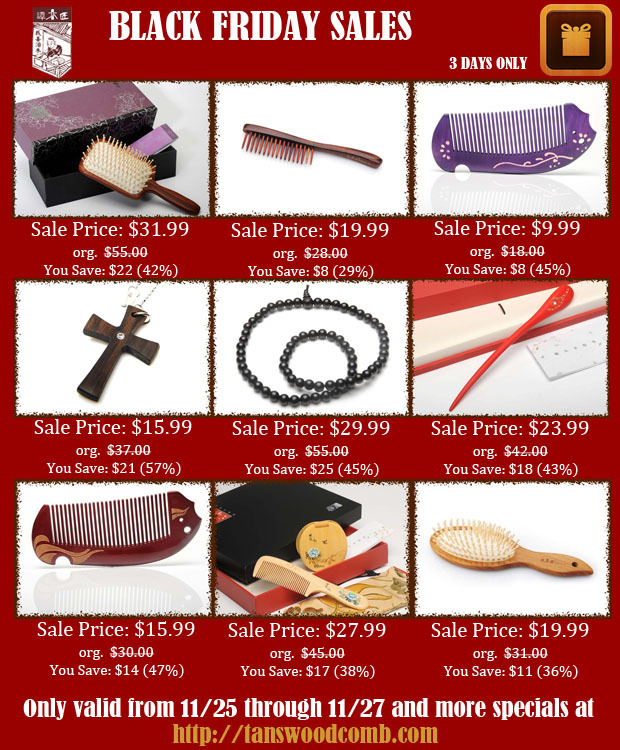 Why do Chinese or even most Asian people like using horn to make combs? Because they believe this material is good for health. Horn, including the buffalo horn and ram horn is bitter and salty in taste and cold in characteristics . Based on traditional Chinese medical science, it has the medicinal functions of eliminating pathogenic factors, removing heat and toxic elements, promoting blood circulation and removing blood stasis. Also the buffalo and ram horn is the blood-cooling medicine with major function of chills and fever treatment, headache treatment and toxic heat eliminations. The main composition of the horn is keratin, which can help preventing and controlling rheumatism. Therefore, people choose horn to make combs and massage tools to bring out the “bad blood” and cold from head and body to make your more comfortable and healthy. Comments Off on Why horn? Hormones. The male hormones called androgens are usually the main reason of too much oil producing, which leads the oily hair and acne. Shampooing. Shampooing can help clean the hair, as well as strips hair of all protective oil. So the scalp produces more oil after shampooing. Therefore, the more frequently you shampoo your hair, the more your scalp produces. Brushing and combing. Brushing and combing hair helps to distribute the sebum down the shaft of the hair. Usually, experts suggest women to brush hair 100 strokes every night to help spread the natural oil to hair ends. But to the people who have the oily hair, too many brushing or combing might stimulate the scalp to produce extra oil which makes the situation worse. Clean the hair in the right way. Experts suggest the people who have the oily hair to use the special shampoo formulated for oily hair. Pay attention to the water temperature. Do not use too hot temperature to wash hair because hot temperature can stimulate scalp to produce more oil. Do not use brush too often. Try to comb hair only, do not stimulate scalp. Use hairstyle product as less as you can. Hairstyle product usually contains some chemical which makes the scalp produce extra oil. If you have to, pick up the organic one. Pay attention what you eat. Do not eat too much processed food. Taking a supplement with saw palmetto extract has been shown to balance sebum production. Herbs like rosemary, eucalyptus, and sage act to reduce sebum buildup and promote more body. Fortunately, for most of the people, especially the female, it is no need to worry a lot about the permanent hair loss. However, keep the hair healthy, stronger and reduce the hair loss are the mandatory hair care course that everyone should take. Besides the tips we mentioned in our last blog, here are more for the people who want to prevent the unnecessary hair loss. Avoid chemicals. Dying and ironing hair can make hair too dry. Destroy the natural balance of the scalp. Give hair enough time to rest between dying or ironing. Massage scalp. Using finger to comb your hair and scalp twice a day, 2-4 minutes every time. Massage can help release pressure, increase blood circulation and stimulate the hair growth. You can also use all natural beauty tools, such as boxwood comb and boar bristle brush to massage hair and scalp. Pay attention what you are eating every day. Protein is the essential nutrition that hair needs to grow. Fresh fish, meat, soy beans, milk and eggs are good source of protein. Food contains rich minerals. Lack of Vitamin A can cause hair loss and flakes. Carrot, spinach, almond, walnut, mango, fish and shrimps contain rich vitamin A. Vitamin B can speed up metabolism of scalp. And vitamin C can help hair absorb the nutrition from blood. Trace element. Copper and Ferrum also play important role in hair care. Lack of copper can make the hair color fade. Ferrum makes sure that blood can provide enough oxygen to hair. Green veggies are good source of trace element. Don’t forget have them every day. Ask Tan’s — Do you wash your hair every day? A: You should not wash your hair everyday unless your hair is extremely oily. No matter how natural the shampoo and conditioner are, they contains some chemicals. Hair and scalp need at least one day to rest from shampoo. Wash hair too much can take your natural skin oil off and make your hair too dry. Wash your hair every other day is a proper frequency. If you have a really oily hair, try the “dry” shampoo. No Comments on Ask Tan’s — Do you wash your hair every day? Not only the middle age male are facing the threats of bald, but also all the people, different ages, different races, different body situation, are facing the possible problem of #hair loss. A lot of reasons can lead the hair loss. Some of them can cause the permanent, such as Excessive hair loss; and some of them can cause temporary hair loss. If you unfortunately have the problem of permanent hair loss, you need to ask your doctor for the proper treatment or medicine. Here are some tips to help treat the Excessive hair loss. Choose the natural material combs or brushes. The best are wood or horn. Try to avoid plastic combs which can cause the static electricity. Using the wooden or horn combs can help prevent the flake and massage the scalp, increasing the blood circulation, stimulating the hair growing. Keep the hair clean. Wash hair on daily basis or every other day. Do not use too hot water. Massage scalp while washing hair. Try to avoid hair drier. Choose the right shampoo. Do not use the shampoo that can make hair too dry. Organic or all natural hair shampoo is a good choice. Do not always use the same shampoo and conditioner. Change them on regular basis. Quit smoking. Smoking can cause the blood capillary of scalp shrink which is bad for hair growth. Take enough rest, release pressure. Pressure can cause very serious physical problem, including excessive hair loss. Deep breath, regular exercise and walking can help release pressure. Ask Tan’s – How can you grow your hair longer, faster? I get it trimmed every two months to keep it healthy. I make sure my stylist doesn’t cut TOO much off when she trims, and I also wash twice a week and deep condition every night, because my hair is a little dry. I do an oil treatment once a month, and massage my scalp every night in the shower. I have a healthy diet, and still don’t understand WHY my hair is the same length as it always is. Sometimes I wonder that as it grows, it just gets curlier, and you just can’t tell. But if I straighten it, which is once in a blue moon, it doesn’t look any longer. Basically, you cannot speed up the growing of your hair. Seems you do a very good job of hair caring, your hair should be very healthy. And you can use one more method make your hair stronger and healthier: massage your scalp. Massage your scalp can accelerate the blood circulation of your head skin, and hence, provide more oxygen and other nutrition to your hair. You can simply just use your finger to do the massage, twice a day, make sure comb your hair and scalp at least 50 times. Or you can also choose some all natural combs/brushes to do the massage, such as combs are made of natural wood or horn. No Comments on Ask Tan’s – How can you grow your hair longer, faster? Like the intimate friends in your life, combs are the “close friends” to your hair. They are the necessary beauty tools that you will use on daily basis, so it is important to choose the great and right combs. Otherwise, the wrong one might be harmful to your hair and health. Combs should be strong and durable. No sharp ending. Pick up the proper size according to the size of your hands. The good combs can comb hair easily. Some material could be too rigid to comb hair. The one with some flexibility is easier to comb. Avoid the material which can cause static electricity, such as plastic and metal. Try the combs first. You can try the combs on your hand to see if the teeth are too sharp for you. If you have a lot of hair, pick up the combs with wide teeth. The round ended teeth are better than the sharp one. Prepare at least one wide teeth comb for it is the best to comb your wet hair without any damage. Keep the combs clean. If you choose the all natural wooden combs, do not soak it under water for long time.